And all that had happened to her would be, must be, pushed down, out of sight; the details of daily living would come like falling leaves to cover it. Sadly I did not read this edition of Elizabeth Sanxay Holding's terrific novel -- I have a great fondness for tacky covers, though I must say this one is rather too tacky for the extremely delicate and moving subject matter of the novel. I read the Persephone edition instead, and I was very happy to get hold of it as I'd been longing to read it since I first heard of the novel in the Guardian's March feature on Ten Best Neglected Classics. In fact this illustration does represent, after a fashion, the event which precipitates the plot. Lucia Holley goes for a swim in the early morning (not in her undies, though -- that's a fantasy of the illustrator's) and discovers a dead body in a boat. The body is that of her teenage daughter Bee's extremely dodgy lover, and Lucia, knowing that her elderly father has had an altercation with him the night before, realises that the man's death was an unfortunate accident. He had fallen on the spare anchor and it had pierced his throat. Father did that, she thought. She stood in the gently rocking boat, feet apart, tall and long-legged in her white robe. Of course it means the police, she thought. Then Father will have to know that he did this. They'll find out why Ted came here, and Bee will be dragged into it. And I shan't be able to keep it from Tom. Not possibly. It'll be in the tabloids. Now what you need to know is that all this is taking place in wartime New York State -- the novel was published in 1946. Lucia's husband Tom is in the Pacific and she feels increasingly distant from him as she tries to hold the family together on her own. Like most women of her class and generation, she has led a drastically limited existence. Married at seventeen, she has depended on Tom for everything and now he is away she is struggling with rationing, difficult teenagers, and an increasingly frail ageing father. The children love her, but regard her with rather patronising pity for her innocence of what they think of as real life. But now, with the discovery of Ted Danby's body, real life has come and hit Lucia squarely between the eyes. Fiercely protective of the family, terrified at the thought of involving her young daughter in a scandal, Lucia decides to conceal the body, an act which will have the most appalling repercussions. This is generally described as a crime novel, but it's not a conventional one. No crime has actually taken place apart from Lucia's panic stricken act of concealment. But crime soon seeps into her ordered existence, and she finds herself subjected to blackmail and facing threats from both the police and the dark underworld from which Ted had emerged to attempt his seduction of Bee. It also brings her into contact with Martin Donnelly, a one-time associate of Ted's, with whom she starts to forge an unlikely but powerful bond. I really did that, she thought amazed. I concealed a body. Anyhow, I took it away. And when I came back -- after that -- nobody could see anything wrong with me -- anything queer. Maybe I haven't got so much feeling, after all. Maybe I'm rather too tough. I'd better be, too, she thought, as she rose and began to dress. I really loved this novel. It was absolutely rivetting, but interestingly so much so that I didn't want to read it too fast -- I took my time and savoured every minute. I said at the beginning that it was moving and so it is -- for Lucia's struggles and her pain, but also for the wonderful characterisation of Martin Donnelly and the relationship that develops between the two of them, which is brilliantly understated but so clearly there. I can't recommend it highly enough. The novel has been filmed twice, as The Reckless Moment in 1949 and as The Deep End in 2001 (with Tilda Swinton). I haven't seen either and I don't want to because I can tell that both of them have changed the novel and I would be sad to see anything changed. It's perfect as it is. Read it! 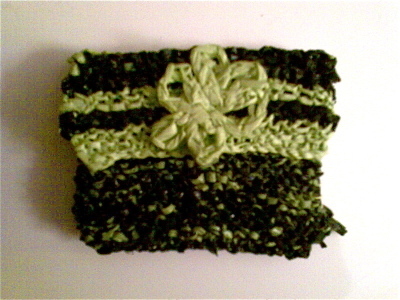 This is a little purse, about 4 inches by 3. It's knitted from Marks and Spencers carrier bags -- the really rather attractive pale lime green ones from the food department which, I think, they are not using any more (I don't shop there much), interspersed w ith a very good quality clothing department bag which was dark green on one side and lime green on the other, hence the sort of mottled effect. (Unfortunately my camera is not working so this photo was taken on my mobile -- that's why the colour is not great and the pictures rather rubbish). The other picture is a much larger bag -- about 9 x 12 inches and is made from the bags you get if you have your groceries delivered by Ocado (aka Waitrose). They have a rather nifty system of putting different types of food (frozen, fridge and cupboard) in different coloured bags. I've only ordered from them once but the bags were so nice I was impelled to get out the needles and was rather pleased with the result. I'm now using up all those Asda Christmas bags, white with red logos, which are coming out with a very pretty random effect. Watch this space! Ever got fed up with the number of plastic carrier bags that seem to build up in your cupboard in increasingly large numbers? I try to remember always to take the re-usable ones but often forget to put them back in the car afterwards. So I thought I'd have a go at doing something useful with them and here is the first effort -- a rather cute little knitted bag, measuring perhaps six inches square. 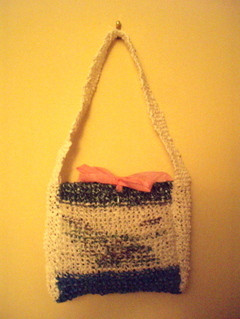 Believe it or not, this took about eight carrier bags to make, plus about another two for the handle. The central white section, with the attractive random pattern, is made from Asda bags, with their green and black lettering. The needles are numbered 4. Of course the first job is to cut the bags into strips, which is actually not difficult as you can simply start at the top and form a long strip by going round and round the bag. It is much harder to knit than wool, of course, but you get used to it. The trouble is, you start looking for attractively coloured bags for new projects, which perhaps slightly spoils the object of recycling. I haven't got to the point of actually buying things in order to get hold of the bags, but I can imagine it happening. I've got two lovely pink Laura Ashley ones -- the little bow on top here is made from a bit of one of them -- and might try combining this with M&S bags, which are lime green inside and dark green outside. 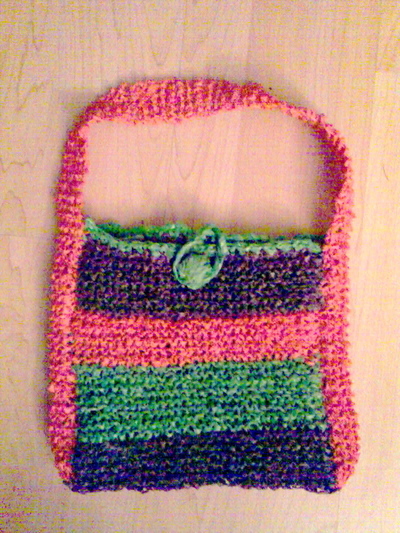 I'd love to make a regular carrier-bag sized knitted bag, but I don't think I have the patience to do it. So it will be more little ones, probably, to give away for Christmas. My little grandson Cai will be five on Thursday and I have just finished knitting him this jacket. The photo does not do justice to the colour, which is a lovely deep red -- I used some very nice Jaeger wool that I'd bought ages ago to make something or other for myself which I never did get around to. It's a guernsey-type pattern, with a very attractive patterned yoke which repeats at the top of the sleeves. I got some buttons shaped like ladybirds though very sharp-eyed people may notice that there is one missing as I miscounted and will have to go to town to get the last one. No idea of he will actually want to wear it, of course -- but I had a lot of fun making it.